It’s been a while since I posted and there has been a little guilt. Don’t worry I haven’t stopped eating I have just been very slow to write about it. I promise to do better. I also have to confess to being given a little prod by EvieSaffronStrands who asked for my cherry clafoutis recipe. August is one of the most productive months of the year for fruit and vegetables and one of the busiest in my kitchen. I try and preserve all I can for the coming winter months by turning whatever is in season into jams, jellies and chutneys. The fruit grown in the garden is usually eaten before we have reached the kitchen door. So excited and amazed are we, that anything so wonderful could be grown just a few feet away. I also secretly think that it is just too good to be used for preserving and best eaten and enjoyed straight away. There are a few farms that I buy from direct. Each farm is favoured for a particular fruit or vegetable. One on my list is a farm that supplies the most wonderful cherries and plums. This year their cherries have been delicious and we have arrived home with an empty basket because we couldn’t resist eating them en route. On the last two visits I have been spoilt for choice on the cherry variety front. This time the cherry season was coming to a close for this particular farm and Valentine cherries were the last to be had. Not only the last variety but the last bag. It didn’t take a moment to decide that I would make one last clafoutis before the season ended. To make sure they actually got home without being tampered with they went straight into the boot, out of reach. 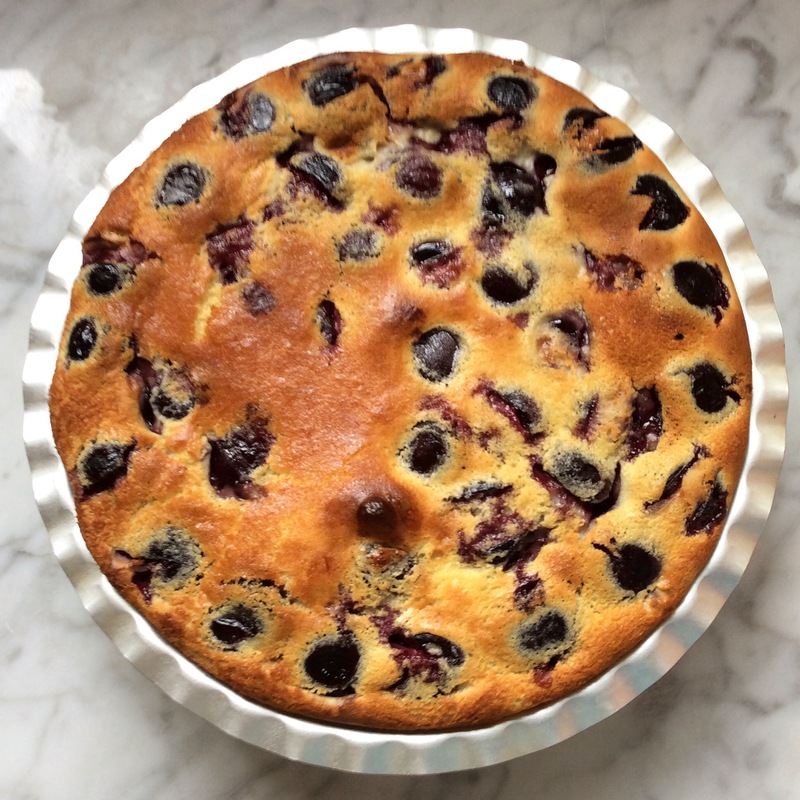 Many clafoutis recipes call for the stones to be left in, suggesting that it gives the cherries a more almond flavour. I feel that any benefit that this may give (and I don’t think it does) is far outweighed by the chance of a broken tooth. I don’t have a cherry stoner so use a small sharp knife to slit each cherry, giving me enough room to prise the stone out, thus keeping the cherries nearly whole. Just in case I have robbed the dish of an almond presence, I soak them for a couple of hours in Amaretto, which is a rich nutty almond flavoured Italian wine. It adds flavour to the cherries without overpowering them – but you can certainly taste it. The texture of the batter is very much like that for bread and butter pudding. Butter to grease the tin and a couple of teaspoons of caster sugar to coat the tin. 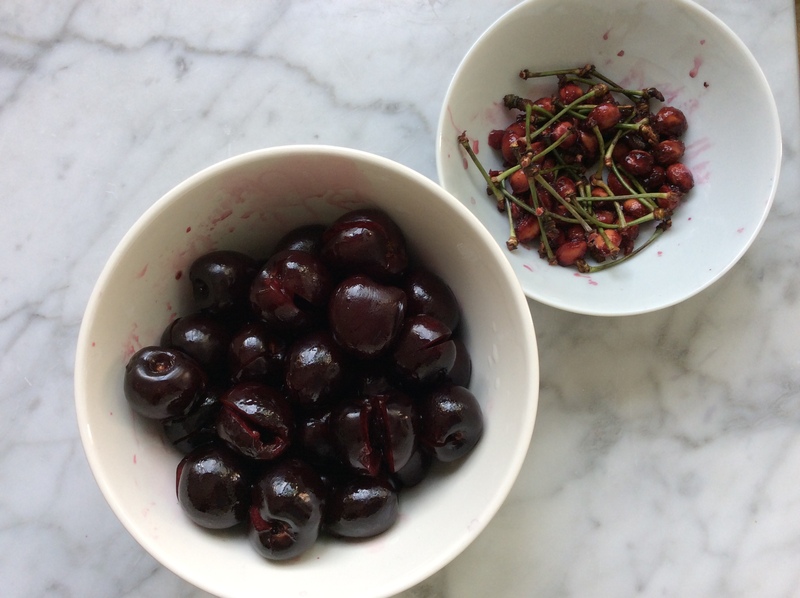 Wash the cherries and remove the stones, place in a bowl. Add 3 tablespoons of Amaretto. Leave to soak for 2 hours. Turn on oven to 350F/180C/Gas mark 4. Grease a 9 inch/23cm pie tin with butter and sprinkle with caster sugar. In a bowl add the 3 eggs, flour, sugar, salt and melted butter along with the milk and cream. Beat well or use a blender until a smooth batter is achieved. Cover and leave to stand for at least 30 minutes to rest. Drain the cherries and place in the pie tin to create a single layer. Give the egg batter a stir and then strain through a sieve onto the cherries. Place in the upper middle of the oven. Check after 35 minutes – the clafoutis is cooked when the batter has risen up and turned a deep golden brown. I have found in my gas oven the clafoutis takes 45 minutes maybe a little more maybe a little less. After 35 minutes the batter should have set which allows me to turn the clafoutis around so as to create an even browning. Remove from the oven slightly cool and serve. Dust with icing sugar for more eye appeal and eat on its own or with double cream. Easter for me is the true beginning of Spring. Like our winter clothes, the foods in the kitchen start to change. The heavier dishes of casseroles, soups and steamed puddings begin to be replaced with a wider range of seasonal vegetables, salads and fruits. What better recipe to show this than Ravani – the lightest of sponge cake, laced with a light sweet syrup with a hint of lemon. The coconut works so well with this recipe as it adds a wonderful texture to the sponge and goes beautifully with the lightly flavoured citrus syrup. Every home in Greece must have it’s own recipe. I couldn’t guess how many variations there are of this recipe. Ravani is a typical Greek traditional semolina cake that is baked for festive occasions. No doubt with the Greek Orthodox Easter celebrations coming up this weekend there will be an array of Ravani cakes being made. I can remember Panayota, my aunt’s cook, making this. 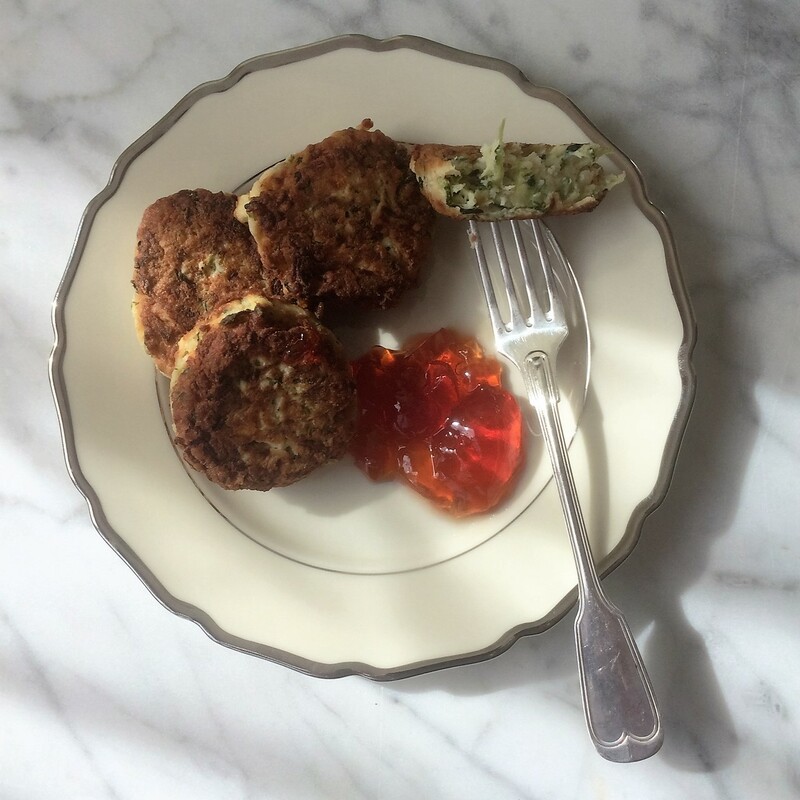 No doubt a recipe handed down to my aunt from her mother (my great grandmother) and then perfected to my aunt’s taste over the years. She was a very exacting lady and would hover over poor Panayota making sure no mistakes were made. I can remember sitting in her beautiful light and airy Salonee on a large sofa that was, like every piece of furniture in the room, covered in its custom made fitted linen cover. I had to fight the strong urge of jumping up and lifting up these covers to discover what lay underneath. My aunt is no longer with us and I never ever found out what those covers hid. It will remain one of those mysteries. I was always very respectful and would sit politely until a small plate would be presented to me. On it would sit a piece of their ravani cake and a linen serviette, just in case. My aunt would sit across from me with Panayota proudly standing behind her, waiting for my reaction. Hollywood has never called, but at least my aunt was convinced that I loved it. Trouble was, I was never too keen on their version! It was heavier and sweeter than this recipe and it definitely didn’t contain coconut, to which I am rather partial. I think I can now say that I have found my own version of the recipe which I hope will continue down the family line. I know I won’t be getting any commanding performances, as my family are quite happy to tell me if they don’t like it. The sun may be a little shy this weekend in London but the Ravani will certainly be shining out over our Easter celebrations. 1 unwaxed lemon cut in half. Grease and flour a 22 cm cake tin. Beat the egg yolks with 100gms (not all) of the caster sugar until thick, creamy and very pale. In a clean bowl, beat the egg whites with the remaining 40g of caster sugar until stiff. In a bowl mix together the flour, semolina and desiccated coconut. Add one third of the egg whites to the egg yolks and fold in gently. Sprinkle the dry ingredients over the egg mixture and combine. Fold in the rest of the egg whites. Turn mixture into a 22cm cake tin. Place in the oven and leave for 20-25 minutes. Test with a knife after 20 minutes to see if it is cooked (knife will come out clean if cooked). If not, leave for a further 5 mins and test again. When cooked remove from the oven and leave to cool in the tin. Add to a saucepan 300ml water and 300g caster sugar. Add the whole lemon, cut in two. Bring to a boil. The syrup should then be allowed to boil for exactly 3 minutes. Remove from the heat. The cake should be cool when the hot syrup is added. Pour over the cake which is still in its tin. Cover with cling film well, and turn the tin upside allowing the syrup to distribute. After a few minutes flip the tin over – this helps to stop the syrup from collecting at the sides and bottom of the tin. This can be repeated a couple of times until the syrup has cooled. Unwrap and sprinkle a tablespoon of desiccated coconut over the top. Serve. N.B The ravani in the picture was baked in a 8″ cake tin as I couldn’t find my original 22 cm cake (now found in another cupboard). The ravani took longer to cook around 35 mins and proved difficult when pouring the syrup.